Ultimate Marvel VS Capcom 3. 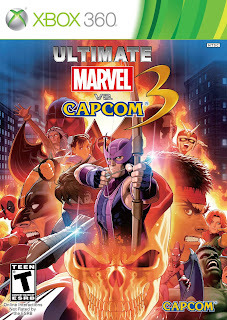 I absolutely love this game for one reason, it is a Marvel game. You aren't restricted to say just the X-Men side of things or the Avengers side of things, you get the full breadth of Marvel goodies. Of course you still get the staples, Iron Man, Wolverine, and Spider-Man, but you also get the more obscure characters such as Ghost Rider, Rocket Raccoon, Nova and Iron Fist. And it is fun. The fighting engine is fast and fluid, keeping you on your toes. The mechanics are simple enough that anyone can pick it up and play, but it is exceedingly difficult to master. I have many memories of liquor fueled nights with my brother just going back and forth back and forth. This is a game that makes friendships.